Maria Semenovna Melyukova was a close spiritual friend of St. Seraphim and his novice. She came to the community in 1823 at the age of 13 and took upon herself the exploit of silence. She "was always immersed in completely undisturbed prayer" Her ascetic life surpassed in its strictness the strictest sisters, and her obedience to St. Seraphim was unquestioning. She was so spiritually close to St. Seraphim that the elder revealed to her all the secrets about the future of the monastery and the revelations that he had received from the Holy Theotokos. After her death on August 21, 1829, St. Seraphim revealed to the sisters of Diveyevo that he had tonsured her into the schema and that now "her soul was in the Heavenly Kingdom and near the Holy Trinity at the Throne of God, and the whole of your race will be saved through her!" (p. 267). 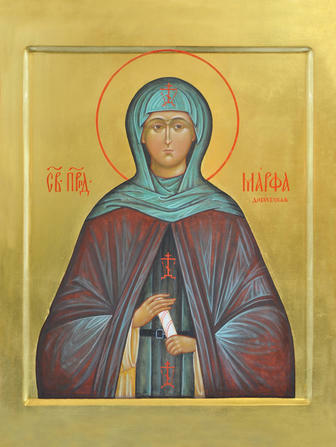 Everyone then rejoiced at the appearance in the heavens of a new intercessor for the monastery and the whole world, while the elder Seraphim called everyone to the burial of Schema-Nun Martha, promising those present the remission of their sins. During the funeral the eldress Praskovya Semenovna, the sister of the reposed, clearly saw in the Royal Doors the Queen [of heaven] and Mother Martha standing in the air. Praskovya Semenovna then began to play the fool, to prophesy and to distribute her clothes. Then everyone heard cries and the sound of demons being driven out. When this was told St. Seraphim, he said: "This was the Lord and the Queen of heaven wanting to glorify our Mother Martha and Lady Mary. And if I, wretched Seraphim, had been at the burial many would have received healing from her spirit!" Later, being in the Holy Spirit, St. Seraphim once more confirmed that Schema-Nun Martha "is standing in the Heavenly Kingdom at the throne of God near the Heavenly Queen with the holy virgins! She is an intercessor for the whole of your race!" And he laid down that they should pray at her grave. (pp. 268-269).